Ministering in Mt. Washington for these last nine years has presented our family with great blessings and many new friends. We have experienced God's faithfulness in ways that we never dreamed possible. We are grateful and confident that we serve a loving, merciful God who is greater than any obstacle we might face. I sincerely believe that our mission and our passion is to help men and women to become more intimately, passionately and powerfully connected to God. Our prayer is that each individual will be empowered to become their personal best, live to their full potential and experience total fulfillment and victory in their lives. God has given us some precious people here at Mt. Washington Church of God, who have sincere loving hearts that glorify His name. Our goal and purpose is to see the Gospel of Jesus Christ spread in the Mt. Washington area and around the world. Working for my Savior and seeing many come to know Him remains my greatest joy. 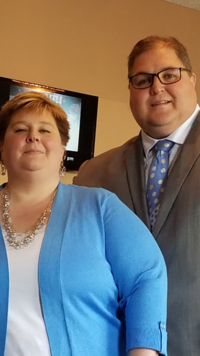 Pastor Scott is a Ordained Bishop in the Church of God(Cleveland, TN) and proud husband to his wife Joy and the father of two daughters, Jessica (Adam) and Jennifer who are very much a part of everything they do. Pastor's Scott and Joy preach and live out the principle of family as their first and most important ministry. Beyond that, doing all things as if unto the Lord (Colossians 3:23) is the primary motivating force behind our family's lifestyle and ministry.